Die Martis, videlicet, 12 die Julii. Message to the H. C. that the Lords agree to the Leicester Instructions. Additional Guard for The Tower. L. Magwire and Mac Mahowne separated. Propositions of the Lieutenant of The Tower, about Prisoners there. Message to the H. C. to sit P. M. and with the Declaration that People shall not be compelied to serve the King against their Inclination. The King's Letter delivered to Him. Committee to to consider of a Locum Tenens, during the L. Mayor's Confinement. Declaration, that the Subjects shall not be compelled to serve the King against their Will. with an Order for the Earl of Warwick to go with the Fleet to the Assistance of Hull. Order for Sir Jo. Hotham to deliver the Remainder of the Magazine of Hull to the E. of Warwick. Sir Edward Stradling and others sent for. and with an Order for Lords Lieutenants to appoint Officers to the new raised Forces in the several Counties. Report from the Committee about a Locum Tenens, during the L. Mayor's Confinement. Message from the H. C. with some Votes for the Lords Concurrence. E. of Essex to be General. For an Army to be raised. Petition to the King, to compose Differences. Resolution of supporting the E. of Essex. Message from H. C. about Whitecomb's Order. Letter from the Earl of Warwick, about Payment of Money to the Navy. Order for House to be raised in Hartford. Order for Horse to be raised in Bucks. Earl of Essex named General. Petition to be presented to the King, to accommodate Differences. Lord Ruthin and Sir Arthur Haslerig 500l. Proposition-money. Doctor Prideaux and others sent for, from Oxford, for lending the University Plate to the King. Guard about Oxford and other Counties, to prevent Plate, &c. being sent to York. To let the House of Commons know, that this House agrees with the House of Commons in the Declaration and Instructions to the Lord Ruthin, etc. with Amendments in the Margin. Ordered, That Margeret Medcalfe, a poor Woman, shall have Thirty Shillings paid her out of the Poor's Box. That they agree to the Amendments and Alterations in the Declaration and Instructions. The Lieutenant of The Tower acquainted this House, That he hath taken in Fifty Bands of the Hamlets, to watch for the better Safety of The Tower." That the Lord Magwire and Mac Mahowne are lodged both in one Tower, and they found an Opportunity to speak to one another, through a Hole in the Floor; but now he hath divided them." Next, he offered some Propositions to this House, and desired their Lordships Command and Pleasure therein. "1. Shall my Lord Mayor have the Liberty of The Tower?" "2. Shall he have Liberty to speak with the Bishop of Cant.?" "3. May he speak in private with any Man?" "4. How many Servants shall be allowed to attend him?" Agreed and Ordered, That he shall be allowed, for him and his Lady, Six Servants, Two Maids and Four Men; if his Lady live not with him, then but Four Servants. "5. May his Lady lodge with him in The Tower?" Agreed to. "6. Whether he shall give an Account of what Persons come to visit him?" "7. That your Lordships will be pleased to take Order, that Monies may be Ordered, to feed the other Prisoners; for I have not left to buy Bread for myself." Ordered, To have a Conference with the House of Commons about this, and the Payment of the Hamlets that guard The Tower. 8. I have given Order for Fifty of the Band of the Hamlets to come to watch and ward in The Tower; that your Lordships will be pleased to appoint Payment for them. "9. To set down the Number of Servants my Lord of Cant. shall have, for he hath now many." Ordered, That he shall be allowed but Six Servants. Sir John Conyers was called in; and the Speaker, by Order of the House, gave him Thanks for the Care expressed for the Safety of the Two Prisoners, and for providing a Guard to secure The Tower, and told him what this House hath Ordered, concerning the Propositions presented by him. To let them know, that this House will sit at Four a Clock this Afternoon, and desire them to do the like; and to return them the Declaration made against Persons to be compelled to serve the King, etc. with the Alteration of the (fn. 1) Word ["compelled"] instead of ["commanded"]. Mr. Pickeringe declared here, "That when he delivered the Letter from the Lord North, as Speaker of this House, wherein was inclosed the King's Letter to the Queen, which was taken about Mr. Ashburnham, and sent with other Letters to the Parliament, His Majesty told him, the Parliament had Two of His Letters which He had written to the Queen, and that this Letter was that was sent by Mr. Willmott; which was averred by Mr. Willmot to be that Letter which was delivered to him by the King; and that the King said, that this was but Half a Courtesy in my Lord North, to send but One Letter, when he had Two Letters of His." Sir Nic. Raynton and Alderman Garraway were called, to give this House Satisfaction concerning the Locum Tenens, now the Lord Mayor is committed to The Tower; and this House receiving no Account that was satisfactory from them, the House appointed the Earl of Portland, the Lord North, and the Lord Robartes, to be Committees, to speak with some Aldermen and the City Council, and to see Records for Precedents, and to inform themselves by all other Means they can, concerning this Business; to meet this Afternoon. Ordered, That Serjeant Pheasant, and Serjeant Greene, and Mr. Mosse, shall have Notice to attend the said Committees this Afternoon, at Two a Clock, in the Painted Chamber. The House appointed the Lord North to be Speaker this Afternoon. That they agree with their Lordships in the Declaration, with the Amendments. 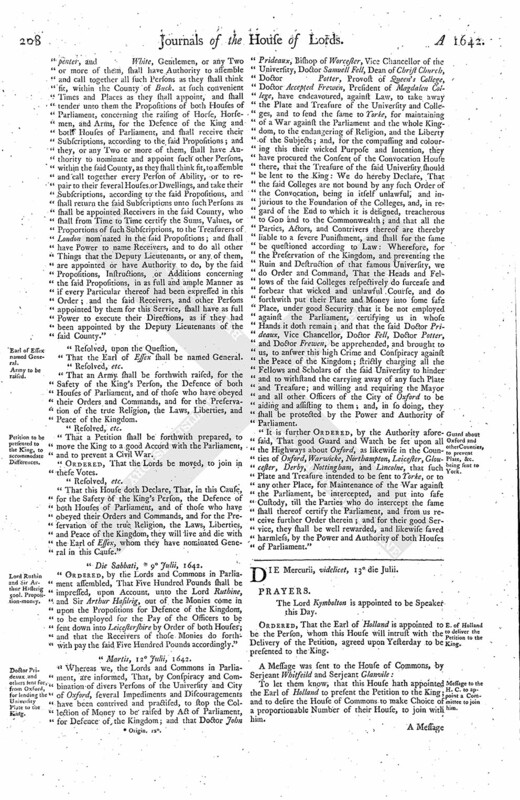 "The Lords and Commons in Parliament do Declare, That it is against the Laws and Liberties of the Kingdom, that any of the Subjects thereof should be compelled by the King to attend Him at His Pleasure, but such as are bound thereto by special Service; and if any Messenger or Officers shall, by Colour of any Command from His Majesty, or Warrant under His Majesty's Hand, arrest, take, or carry away, any of His Majesty's Subjects, to any Place whatsoever, contrary to their Wills, that it is both against the Laws of the Land, the Liberty of the Subject, and is to the Disturbance of the Public Peace of the Kingdom; and any of His Majesty's Subjects so arrested may lawfully refuse to obey any Arrests and Commands." "Ordered, by the Lords and Commons, That the Earl of Warwicke be desired to take with him such Ships, and so many, as he shall think fit, and as well manned as may be, and, with all Expedition, go into the River of Humber, to give all possible Assistance to the Town of Hull: It is further Ordered, That he shall receive and send up hither such Horse Arms, Saddles, and other Ammunition, as shall be delivered unto him by Sir Jo. Hotham, Governor of that Town." "Ordered, by the Lords and Commons, That Sir Jo. Hotham, Governor of Hull, shall deliver out, unto such Persons as the Earl of Warwicke shall appoint, those Horse Arms, Saddles, and other Ammunition, which remain behind, Part of the Magazine formerly Ordered to be sent up, and as shall not be necessary for the Defence of the Town." "Ordered, That Sir Edw. Stradling, Colonel Ashburnham, the French, and all those other Persons that were taken in the Ship with them, be forthwith sent for up, in safe Custody, and that the Lords be moved to join herein; and that the Earl of Warwicke be desired to take Care they be sent by Sea in a safe Manner." Ordered, That this House agrees with the House of Commons, That the Persons in this Order shall be sent for; and that no Writ nor Execution shall be served upon Sir Edw. Stradling during the Time that he stays here. 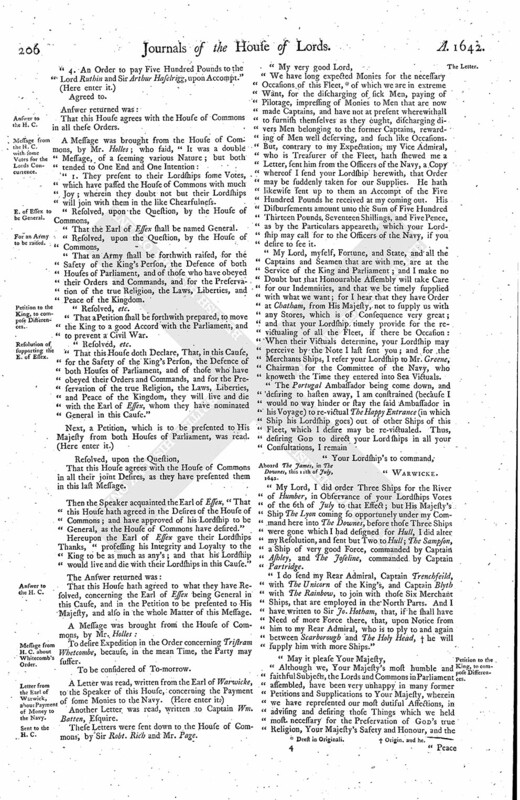 "It is this Day Ordered, by the Lords and Commons now in Parliament, That the Lieutenants of the several Counties shall make Captains, and other Officers, of such Troops as shall be levied and exercised in their respective Counties, upon the Propositions for bringing in Horses, Money, and Plate." That this House agrees to all the Orders now brought from the House of Commons. The Lord Robarts reported, "That some of the City Counsel have waited on the Committee, concerning what the Custom of the City hath been, in calling a Common Council, in case the Lord Mayor dies. And they said, That, in that Case, a Common Hall hath been called, but could not inform who did call it; but do refer their Lordships to Mr. Mosse, Mr. Latham, and Mr. Childe, Clerks in the Mayor's Court, who can inform more particularly." Ordered, That these Parties be sent for, to attend the Lords Committees To-morrow Morning. 4. An Order to pay Five Hundred Pounds to the Lord Ruthin and Sir Arthur Haselrigg, upon Accompt." That this House agrees with the House of Commons in all these Orders. 1. They present to their Lordships some Votes, which have passed the House of Commons with much Joy; wherein they doubt not but their Lordships will join with them in the like Chearfulness. That the Earl of Essex shall be named General. That an Army shall be forthwith raised, for the Safety of the King's Person, the Defence of both Houses of Parliament, and of those who have obeyed their Orders and Commands, and for the Preservation of the true Religion, the Laws, Liberties, and Peace of the Kingdom. That a Petition shall be forthwith prepared, to move the King to a good Accord with the Parliament, and to prevent a Civil War. 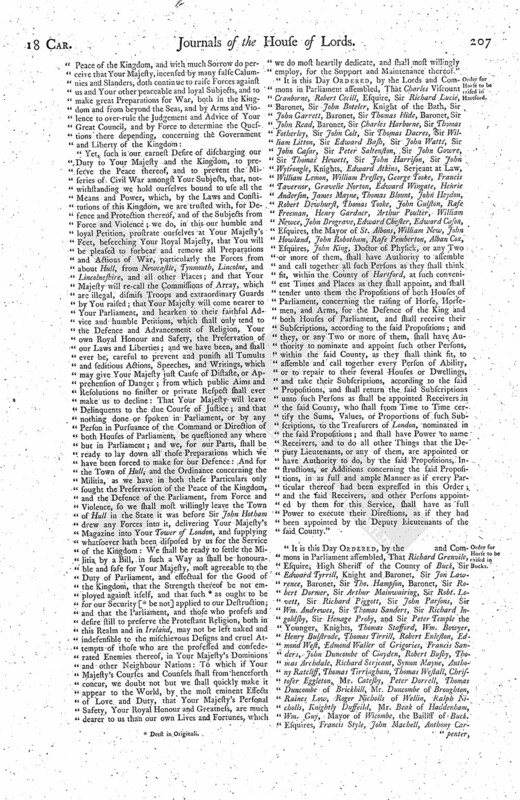 "That this House doth Declare, That, in this Cause, for the Safety of the King's Person, the Defence of both Houses of Parliament, and of those who have obeyed their Orders and Commands, and for the Preservation of the true Religion, the Laws, Liberties, and Peace of the Kingdom, they will live and die with the Earl of Essex, whom they have nominated General in this Cause." Next, a Petition, which is to be presented to His Majesty from both Houses of Parliament, was read. That this House agrees with the House of Commons in all their joint Desires, as they have presented them in this last Message. Then the Speaker acquainted the Earl of Essex, "That this House hath agreed in the Desires of the House of Commons; and have approved of his Lordship to be General, as the House of Commons have desired." Hereupon the Earl of Essex gave their Lordships Thanks, "professing his Integrity and Loyalty to the King to be as much as any's; and that his Lordship would live and die with their Lordships in this Cause." That this House hath agreed to what they have Resolved, concerning the Earl of Essex being General in this Cause, and in the Petition to be presented to His Majesty, and also in the whole Matter of this Message. To desire Expedition in the Order concerning Tristram Whetcombe, because, in the mean Time, the Party may suffer. Another Letter was read, written to Captain Wm. Batten, Esquire. These Letters were sent down to the House of Commons, by Sir Robt. Rich and Mr. Page. "We have long expected Monies for the necessary Occasions of this Fleet, (fn. 3) of which we are in extreme Want, for the discharging of sick Men, paying of Pilotage, impressing of Monies to Men that are now made Captains, and have not at present wherewithall to furnish themselves as they ought, discharging divers Men belonging to the former Captains, rewarding of Men well deserving, and such like Occasions. But, contrary to my Expectation, my Vice Admiral, who is Treasurer of the Fleet, hath shewed me a Letter, sent him from the Officers of the Navy, a Copy whereof I send your Lordship herewith, that Order may be suddenly taken for our Supplies. He hath likewise sent up to them an Accompt of the Five Hundred Pounds he received at my coming out. His Disbursements amount unto the Sum of Five Hundred Thirteen Pounds, Seventeen Shillings, and Five Pence, as by the Particulars appeareth, which your Lordship may call for to the Officers of the Navy, if you desire to see it. My Lord, myself, Fortune, and State, and all the Captains and Seamen that are with me, are at the Service of the King and Parliament; and I make no Doubt but that Honourable Assembly will take Care for our Indemnities, and that we be timely supplied with what we want; for I hear that they have Order at Chatham, from His Majesty, not to supply us with any Stores, which is of Consequence very great; and that your Lordship timely provide for the revictualing of all the Fleet, if there be Occasion: When their Victuals determine, your Lordship may perceive by the Note I last sent you; and for the Merchants Ships, I refer your Lordship to Mr. Greene, Chairman for the Committee of the Navy, who knoweth the Time they entered into Sea Victuals. Aboard The James, in The Downes, this 11th of July, 1642. My Lord, I did order Three Ships for the River of Humber, in Observance of your Lordships Votes of the 6th of July to that Effect; but His Majesty's Ship The Lyon coming so opportunely under my Command here into The Downes, before those Three Ships were gone which I had designed for Hull, I did alter my Resolution, and sent but Two to Hull; The Sampson, a Ship of very good Force, commanded by Captain Ashley, and The Joseline, commanded by Captain Partridge. I do send my Rear Admiral, Captain Trenchfeild, with The Unicorn of the King's, and Captain Blyth with The Rainbow, to join with those Six Merchant Ships, that are employed in the North Parts. And I have written to Sir Jo. Hotham, that, if he shall have Need of more Force there, that, upon Notice from him to my Rear Admiral, who is to ply to and again between Scarborough and The Holy Head, (fn. 4) he will supply him with more Ships." Yet, such is our earnest Desire of discharging our Duty to Your Majesty and the Kingdom, to preserve the Peace thereof, and to prevent the Miseries of Civil War amongst Your Subjects, that, notwithstanding we hold ourselves bound to use all the Means and Power, which, by the Laws and Constitutions of this Kingdom, we are trusted with, for Defence and Protection thereof, and of the Subjects from Force and Violence; we do, in this our humble and loyal Petition, prostrate ourselves at Your Majesty's Feet, beseeching Your Royal Majesty, that You will be pleased to forbear and remove all Preparations and Actions of War, particularly the Forces from about Hull, from Newcastle, Tynmouth, Lincolne, and Lincolneshire, and all other Places; and that Your Majesty will re-call the Commissions of Array, which are illegal, dismiss Troops and extraordinary Guards by You raised; that Your Majesty will come nearer to Your Parliament, and hearken to their faithful Advice and humble Petitions, which shall only tend to the Defence and Advancement of Religion, Your own Royal Honour and Safety, the Preservation of our Laws and Liberties; and we have been, and shall ever be, careful to prevent and punish all Tumults and seditious Actions, Speeches, and Writings, which may give Your Majesty just Cause of Distaste, or Apprehension of Danger; from which public Aims and Resolutions no sinister or private Respect shall ever make us to decline: That Your Majesty will leave Delinquents to the due Course of Justice; and that nothing done or spoken in Parliament, or by any Person in Pursuance of the Command or Direction of both Houses of Parliament, be questioned any where but in Parliament; and we, for our Parts, shall be ready to lay down all those Preparations which we have been forced to make for our Defence: And for the Town of Hull, and the Ordinance concerning the Militia, as we have in both these Particulars only sought the Preservation of the Peace of the Kingdom, and the Defence of the Parliament, from Force and Violence, so we shall most willingly leave the Town of Hull in the State it was before Sir John Hotham drew any Forces into it, delivering Your Majesty's Magazine into Your Tower of London, and supplying whatsoever hath been disposed by us for the Service of the Kingdom: We shall be ready to settle the Militia by a Bill, in such a Way as shall be honourable and safe for Your Majesty, most agreeable to the Duty of Parliament, and effectual for the Good of the Kingdom, that the Strength thereof be not employed against itself, and that such (fn. 5) as ought to be for our Security [ (fn. 5) be not] applied to our Destruction; and that the Parliament, and those who prosess and desire still to preserve the Protestant Religion, both in this Realm and in Ireland, may not be left naked and indefensible to the mischievous Designs and cruel Attempts of those who are the professed and confederated Enemies thereof, in Your Majesty's Dominions and other Neighbour Nations: To which if Your Majesty's Courses and Counsels shall from henceforth concur, we doubt not but we shall quickly make it appear to the World, by the most eminent Effects of Love and Duty, that Your Majesty's Personal Safety, Your Royal Honour and Greatness, are much dearer to us than our own Lives and Fortunes, which we do most heartily dedicate, and shall most willingly employ, for the Support and Maintenance thereof." It is this Day Ordered, by the Lords and Commons in Parliament assembled, That Charles Viscount Cranborne, Robert Cecill, Esquire, Sir Richard Lucie, Baronet, Sir John Boteler, Knight of the Bath, Sir John Garrett, Baronet, Sir Thomas Hide, Baronet, Sir John Read, Baronet, Sir Charles Harborne, Sir Thomas Fotherley, Sir John Colt, Sir Thomas Dacres, Sir William Litton, Sir Edward Bash, Sir John Watts, Sir John Cæsar, Sir Peter Saltenston, Sir John Gowre, Sir Thomas Hewett, Sir John Harrison, Sir John Wytrongle, Knights, Edward Atkins, Serjeant at Law, William Lemon, William Presley, George Tooke, Francis Tavernor, Gravelie Norton, Edward Wingate, Henrie Anderson, James Mayne, Thomas Blount, John Heydon, Robert Dewhurst, Thomas Tooke, John Gulston, Rafe Freeman, Henry Gardner, Arthur Poulter, William Newce, John Brograve, Edward Chester, Edward Cason, Esquires, the Mayor of St. Albons, William New, John Howland, John Robotham, Rafe Pemberton, Alban Cox, Esquires, John King, Doctor of Physick, or any Two or more of them, shall have Authority to assemble and call together all such Persons as they shall think fit, within the County of Hartford, at such convenient Times and Places as they shall appoint, and shall tender unto them the Propositions of both Houses of Parliament, concerning the raising of Horse, Horsemen, and Arms, for the Defence of the King and both Houses of Parliament, and shall receive their Subscriptions, according to the said Propositions; and they, or any Two or more of them, shall have Authority to nominate and appoint such other Persons, within the said County, as they shall think fit, to assemble and call together every Person of Ability, or to repair to their several Houses or Dwellings, and take their Subscriptions, according to the said Propositions, and shall return the said Subscriptions unto such Persons as shall be appointed Receivers in the said County, who shall from Time to Time certify the Sums, Values, or Proportions of such Subscriptions, to the Treasurers of London, nominated in the said Propositions; and shall have Power to name Receivers, and to do all other Things that the Deputy Lieutenants, or any of them, are appointed or have Authority to do, by the said Propositions, Instructions, or Additions concerning the said Propositions, in as full and ample Manner as if every Particular thereof had been expressed in this Order; and the said Receivers, and other Persons appointed by them for this Service, shall have as full Power to execute their Directions, as if they had been appointed by the Deputy Lieutenants of the said County." It is this Day Ordered, by the and Commons in Parliament assembled, That Richard Grenvile, Esquire, High Sheriff of the County of Buck, Sir Edward Tyrrill, Knight and Baronet, Sir Jon Lawrence, Baronet, Sir Tho. Hampson, Baronet, Sir Robert Dormer, Sir Arthur Mainwairing, Sir Robt. Lovett, Sir Richard Piggott, Sir John Parsons, Sir Wm. Andrewes, Sir Thomas Sanders, Sir Richard Ingoldsby, Sir Henage Proby, and Sir Peter Temple the Younger, Knights, Thomas Stafford, Wm. Bowyer, Henry Bulstrode, Thomas Tirrill, Robert Enleston, Edmond West, Edmond Waller of Grigories, Francis Sanders, John Duncombe of Clayden, Robert Busby, Thomas Archdale, Richard Serjeant, Symon Mayne, Anthony Ratcliff, Thomas Tirringham, Thomas Westall, Christofer Eggleton, Mr. Catesby, Peter Dorrell, Thomas Duncombe of Brickhill, Mr. Duncombe of Broughton, Raines Low, Roger Nicholls of Wellin, Ralph Nicholls, Knightly Duffeild, Mr. Beak of Haddenham, Wm. Guy, Mayor of Wicombe, the Bailiff of Buck. Esquires, Francis Style, John Machell, Anthony Car penter, and White, Gentlemen, or any Two or more of them, shall have Authority to assemble and call together all such Persons as they shall think fit, within the County of Buck. at such convenient Times and Places as they shall appoint, and shall tender unto them the Propositions of both Houses of Parliament, concerning the raising of Horse, Horsemen, and Arms, for the Defence of the King and both Houses of Parliament, and shall receive their Subscriptions, according to the said Propositions; and they, or any Two or more of them, shall have Authority to nominate and appoint such other Persons, within the said County, as they shall think fit, to assemble and call together every Person of Ability, or to repair to their several Houses or Dwellings, and take their Subscriptions, according to the said Propositions, and shall return the said Subscriptions unto such Persons as shall be appointed Receivers in the said County, who shall from Time to Time certify the Sums, Values, or Proportions of such Subscriptions, to the Treasurers of London nominated in the said Propositions; and shall have Power to name Receivers, and to do all other Things that the Deputy Lieutenants, or any of them, are appointed or have Authority to do, by the said Propositions, Instructions, or Additions concerning the said Propositions, in as full and ample Manner as if every Particular thereof had been expressed in this Order; and the said Receivers, and other Persons appointed by them for this Service, shall have as full Power to execute their Directions, as if they had been appointed by the Deputy Lieutenants of the said County." "That the Earl of Essex shall be named General. "That an Army shall be forthwith raised, for the Safety of the King's Person, the Defence of both Houses of Parliament, and of those who have obeyed their Orders and Commands, and for the Preservation of the true Religion, the Laws, Liberties, and Peace of the Kingdom. Ordered, That the Lords be moved, to join in these Votes. Die Sabbati, (fn. 6) 9 Julii, 1642. 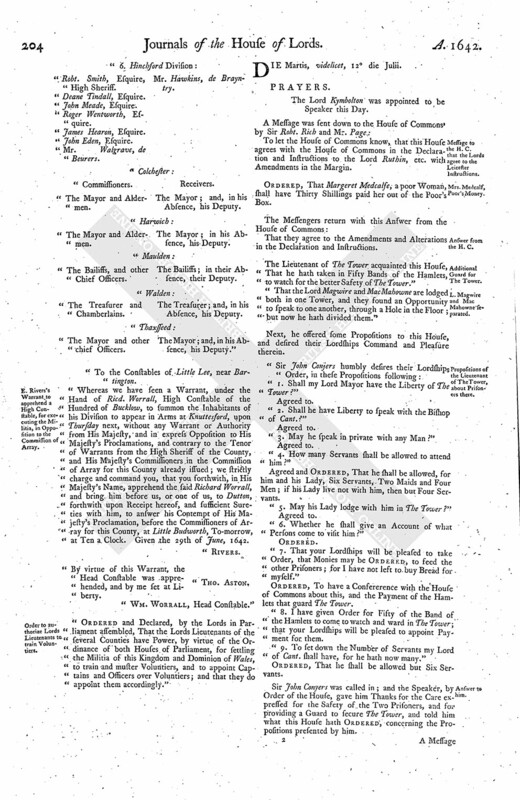 "Ordered, by the Lords and Commons in Parliament assembled, That Five Hundred Pounds shall be impressed, upon Account, unto the Lord Ruthine, and Sir Arthur Hasilrig, out of the Monies come in upon the Propositions for Defence of the Kingdom, to be employed for the Pay of the Officers to be sent down into Leicestershire by Order of both Houses; and that the Receivers of those Monies do forthwith pay the said Five Hundred Pounds accordingly." 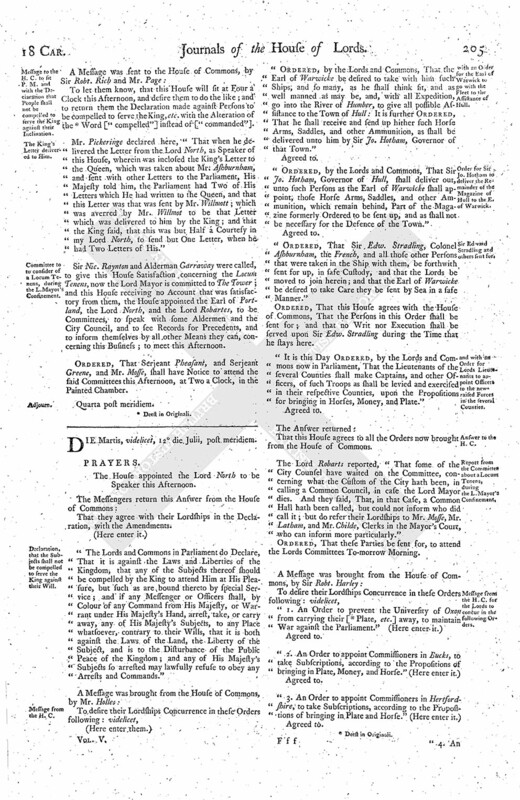 "Whereas we, the Lords and Commons in Parliament, are informed, That, by Conspiracy and Combination of divers Persons of the University and City of Oxford, several Impediments and Discouragements have been contrived and practised, to stop the Collection of Money to be raised by Act of Parliament, for Defence of the Kingdom; and that Doctor John Prideaux, Bishop of Worcester, Vice Chancellor of the University, Doctor Samuell Fell, Dean of Christ Church, Doctor Potter, Provost of Queen's College, Doctor Accepted Frewen, President of Magdalen College, have endeavoured, against Law, to take away the Plate and Treasure of the University and Colleges, and to send the same to Yorke, for maintaining of a War against the Parliament and the whole Kingdom, to the endangering of Religion, and the Liberty of the Subjects; and, for the compassing and colouring this their wicked Purpose and Intention, they have procured the Consent of the Convocation House there, that the Treasure of the said University should be lent to the King: We do hereby Declare, That the said Colleges are not bound by any such Order of the Convocation, being in itself unlawful, and injurious to the Foundation of the Colleges, and, in regard of the End to which it is designed, treacherous to God and to the Commonwealth; and that all the Parties, Actors, and Contrivers thereof are thereby liable to a severe Punishment, and shall for the same be questioned according to Law: Wherefore, for the Preservation of the Kingdom, and preventing the Ruin and Destruction of that famous University, we do Order and Command, That the Heads and Fellows of the said Colleges respectively do surcease and forbear that wicked and unlawful Course, and do forthwith put their Plate and Money into some safe Place, under good Security that it be not employed against the Parliament, certifying us in whose Hands it doth remain; and that the said Doctor Prideaux, Vice Chancellor, Doctor Fell, Doctor Potter, and Doctor Frewen, be apprehended, and brought to us, to answer this high Crime and Conspiracy against the Peace of the Kingdom; strictly charging all the Fellows and Scholars of the said University to hinder and to withstand the carrying away of any such Plate and Treasure; and willing and requiring the Mayor and all other Officers of the City of Oxford to be aiding and assisting to them; and, in so doing, they shall be protected by the Power and Authority of Parliament. "It is further Ordered, by the Authority aforesaid, That good Guard and Watch be set upon all the Highways about Oxford, as likewise in the Counties of Oxford, Warwicke, Northampton, Leicester, Gloucester, Derby, Nottingham, and Lincolne, that such Plate and Treasure intended to be sent to Yorke, or to any other Place, for Maintenance of the War against the Parliament, be intercepted, and put into safe Custody, till the Parties who do intercept the same shall thereof certify the Parliament, and from us receive further Order therein; and for their good Service, they shall be well rewarded, and likewise saved harmless, by the Power and Authority of both Houses of Parliament."